Definition at line 74 of file lltransfertargetvfile.h. Definition at line 94 of file lltransfertargetvfile.cpp. Definition at line 104 of file lltransfertargetvfile.cpp. Definition at line 119 of file lltransfertargetvfile.cpp. 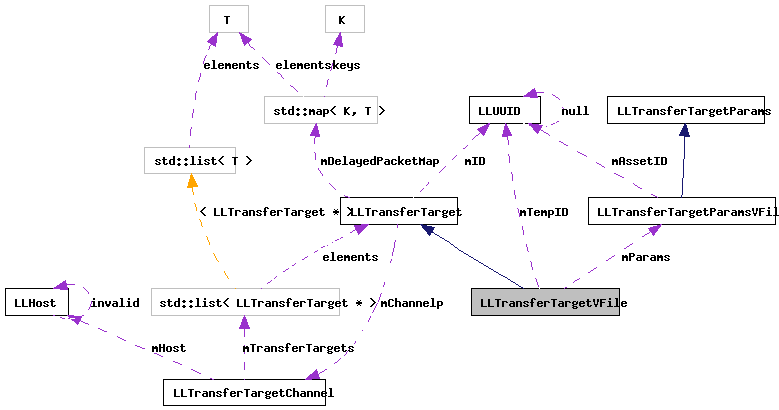 References llendl, llwarns, mParams, LLTransferTarget::mType, and params. Definition at line 157 of file lltransfertargetvfile.cpp. References LLVFile::APPEND, gAssetStorage, LLTransferTargetParamsVFile::getAssetID(), LLTransferTargetParamsVFile::getAssetType(), LL_ERR_ASSET_REQUEST_FAILED, LL_ERR_ASSET_REQUEST_NOT_IN_DATABASE, LL_ERR_INSUFFICIENT_PERMISSIONS, LL_ERR_NOERR, LL_EXSTAT_NONE, lldebugs, llendl, llerrs, LLTS_ABORT, LLTS_DONE, LLTS_ERROR, LLTS_INSUFFICIENT_PERMISSIONS, LLTS_UNKNOWN_SOURCE, llwarns, LLAssetType::lookup(), LLTransferTargetParamsVFile::mCompleteCallback, mNeedsCreate, mParams, mTempID, LLTransferTargetParamsVFile::mUserDatap, LLAssetStorage::mVFS, S32, and LLVFile::WRITE. Definition at line 131 of file lltransfertargetvfile.cpp. References LLVFile::APPEND, FALSE, gAssetStorage, LLTransferTargetParamsVFile::getAssetType(), llendl, LLTS_ERROR, LLTS_OK, llwarns, mNeedsCreate, mParams, LLTransferTarget::mSize, mTempID, and LLAssetStorage::mVFS. Definition at line 110 of file lltransfertargetvfile.cpp. References LLTST_SIM_INV_ITEM, mParams, LLTransferTarget::mSourceType, and LLTransferTargetParamsVFile::unpackParams(). Definition at line 41 of file lltransfertargetvfile.cpp. Referenced by LLMessageSystem::checkMessages(), and end_messaging_system(). Definition at line 95 of file lltransfertargetvfile.h. Referenced by completionCallback(), and dataCallback(). Definition at line 93 of file lltransfertargetvfile.h. Referenced by applyParams(), completionCallback(), dataCallback(), and unpackParams(). Definition at line 96 of file lltransfertargetvfile.h. Referenced by completionCallback(), dataCallback(), and LLTransferTargetVFile().